If you are new to the GMAT and looking for a quicker prep plan, Kaplan Premier is a good book to work with - it provides a good intro to the test (explains the mechanics, basic principles, gets you familiar with the test structure, etc), has solid strategies that you can use regardless of your level, and finally, comes with 5 Adaptive tests. Think of it a starter camera/computer/car/etc - you don't want to start with anything expensive before you know what you are looking for. On the flip side, this book will last you for 3-4 weeks and most likely will only boost your score by 50-75 points. If you want a greater increase (and have 3 months to study, skip this book and pick a bigger caliber package from Manhattan GMAT or Veritas Prep that have a comprehensive overview of everything GMAT-related). * Good amount of coverage for the INTEGRATED REASONING. * What is a good study plan using Kaplan Premier? My recommendation would be to start with this book, finish it in about a month or so (by this time you will learn all the basics about the test, how it works, what is tested, and general strategies for answering questions). Then, you an figure out what's the best use of your time - you may have reached your target score and can stop or perhaps you are really lacking in Quant or Verbal and need a lot more serious practice. * Will this book give me 700+ score? For the majority of applicants, No. It is not deep enough for most people out of college to refresh the math and verbal fundamentals. You will most likely need other books to help you get there. * How do I get 700 then? 2. Thorough/Methodical review of each area - If you have a bit more time, grab the Manhattan GMAT Set of 8 Strategy Guides, Fifth Edition OR Complete GMAT Course Set by Veritas - 15 Book. These books are excellent and are actually used in the classroom setting for their classes, so you are definitely get the top books. If you dont need/want the entire collection, see my review for what stand-alone books to get. This plan is likely to get you a higher score with this section but it will also take up more time (about a month more). Decide on the approach based on your starting position, target score, time you have, and willingness to study math and grammar for months without a break. * Any other books I need to know about? YES. There is one - The Official Guide for GMAT Review, 13th Edition. This book is published by the creators of GMAT and contains real GMAT questions. You should also download the Official GMAT Prep software from GMAC's website (it's free). * What if I have trouble getting through this book? Where can I find help? Let me know if you have any questions about the book - I reply to comments! I'm a full-time GRE tutor, so I bought this to see if it was a resource I could recommend to my students, who often need to relearn a LOT of math. This book is a solid treatment of the math concepts the GRE tests, as well as a decent overview of the different kinds of questions on the test. But, those with higher than average score goals will need to supplement with other books (and of course everyone should be working with ETS's Official Guide). 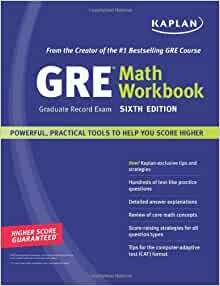 - the book seems to have been modeled on the math concepts that the GRE TELLS us the test covers, NOT on actual observation of GRE tests or practice tests. What the GRE says it will test and what it actually does test are sometimes two different things. So what you're getting is coverage of the concepts you'll need to know without getting the difficulty level or complexity of real GRE math questions. This book will help to a degree, but you'll definitely want to use another source of practice material as well. It's a pretty good resource for those who haven't done math in a long time. I got 99th percentile on my GMAT 750(49, 42) and i used 3 books: this one, Kaplan's Premier Book, and the Verbal Workbook. I had access to PR book and GMAT Prep, but I did only tests from those. I found Kaplan's materials of quality and difficulty. Some whine that Kaplan is too hard, but that's good - if you can handle Kaplan, you can handle the GMAT. Please see the section at the very bottom of the review - I have included a list of my favorite problems from this book - those are the most fun! - Starts with the basics - arithmetic, integers, primes, etc - the stuff that anybody can uses a review of. A lot of applicants underestimate how much they forgot the basics and skim/skip them. I would not do that, and that book does not either. - Finally, the number of questions and quizzes in this book is impressive. I am giving a short summary of some of the sections of the book and number of quizzes and test questions. Quiz questions are math only; Test questions are GMAT-type questions. - No probability or combinations review, which would be very helpful. Get something. I bombed my probability question on the GMAT. - I went through this book at least 3 times (helping others) and I found that solutions don't include some of the most genius ways to handle the problems. I think the authors of the questions went beyond themselves. - Not as thorough as the MGMAT guides (those cover more topics in-depth and perhpas a wider area). Also, if you are rusty with math (really rusty), you may want to get the Kaplan Math Foundations or Foundations of GMAT Math by Manhattan GMAT. 1. No significant updates over the years. This book has remained virtually unchanged since the second edition (for the last 8 years). You are welcome to purchase any of the previous editions to have the same effect. Finally, please make sure you have a copy of the Official Guide for the GMAT (OG) - if you have not discovered it, I highly recommend you get yourself a copy as it is published by GMAC and contains 900 official GMAT Questions. Let me know if you have any questions - I reply to comments!